Background: Born in Hamilton, Ontario, Canada on October 25, 1891 to Irish-Catholic parents, Thomas J. Coughlin and Amelia Coughlin, Charles Edward Coughlin grew up under strict Catholic rule. He grew fond of the idea of joining the priesthood as a teen. Coughlin graduated from the University of Toronto in 1911. He then attended St. Basil’s Seminary in Toronto, and was ordained as a Catholic priest in 1916. Father Coughlin taught for seven years at the Assumption College in Windsor, Ontario, and then moved to the United States in 1923, by way of Detroit, Michigan. 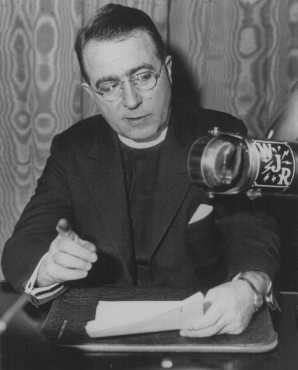 Career: It was in Detroit that Father Coughlin began his broadcasts on radio, on WJR in 1926, where he preached a weekly sermon. By the early 1930s the content of his broadcasts had shifted from theology to economics and politics, just as the rest of the nation was concerned by matters economic and political as a result of the Depression. Until 1931, when the station was unexpectedly dropped, CBS had provided free sponsorship. Determined to keep his broadcasts alive, Father Coughlin raised the necessary money, and continued to reach out to millions of listeners. He was one of the first political leaders to use the medium of radio to reach a mass audience, as possibly thirty million listeners tuned to his weekly broadcasts during the 1930s. institutions of his day. Although his core message was one of economic populism, his sermons also included attacks on prominent Jewish figures–attacks that many people considered evidence of anti-Semitism. The years to come were perhaps the most damaging in the public’s eye. After the election in 1936, Father Coughlin became a sympathetic supporter of the fascist policies of Hitler and Mussolini. His CBS radio broadcasts were blatantly aimed at the Jewish community, citing that “international conspiracy of Jewish bankers” caused the Great Depression, and that Jewish bankers were behind the Russian Revolution. Coughlin then published a newspaper, Social Justice, in which the anti-Semitic views became even more poignant and forthright. After Japan’s attack on Pearl Harbor and the ensuing declaration of war in December of 1941, Coughlin and other isolationists were viewed as sympathetic to the enemy. In 1942, the Catholic community had enough of Father Coughlin’s outspoken views, and the new bishop of Detroit ordered Coughlin to cease and desist with any and all political activities and return to the duties of a parish priest. Coughlin immediately complied and remained the pastor of the Shrine of the Little Flower until 1966, when he retired. Until his death October 25, 1979 at the age of 88, in Bloomfield Hills, Michigan, Coughlin continued to write pamphlets denouncing Communism.